England legend Alan Shearer slammed Brighton's defending in their 3-2 Premier League defeat at arch rivals Crystal Palace yesterday. The Seagulls conceded three poor goals in the first half as Wilfired Zaha and James Tomkins scored following corners and the third saw Zaha given too much space to head home unmarked. Speaking on Match of The day, Shearer said: "You can't expect to take points from a Premier League game defending like Brighton did, particularly in the first half." On Palace's first two goals, Shearer said: "(Dale) Stephens is pointing but he's got to get out quicker to close the ball down. By the time he realises, it's too late and then it's a mistake by the goalkeeper and a tap-in for Zaha. "A few minutes later, another set-piece and Tomkins is free for the header and he's also free for the finish and Brighton have conceded more from set-pieces than anyone else in the Premier League." 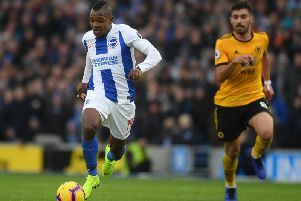 Palace played without a recognised centre-forward as Zaha drifted out wide to collect the ball and Shearer said: "What Crystal Palace did very well was because they didn't play with a centre-forward, the Brighton defenders didn't know what to do. They didn't know whether to go tight on Zaha and (Andros) Townsend because they just didn't have anyone to mark. "Zaha particulary in the first half was excellent and everything they did well was going through him." On Crystal Palace's third goal, Shearer added: "Zaha starts the move on the left-hand side and no one is tight on him, the defenders are looking around. They've got no one to mark, it eventually comes out to the right hand side and it's a brilliant ball in by (Luka) Milivojevic but by the time they (Brighton defenders) realise, they're all looking around and pointing but no one is picking anyone up. "Zaha darts in and it's a great header."